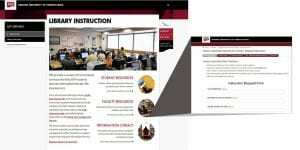 The Indiana University of Pennsylvania Library has a huge collection of resources for educators and staff. 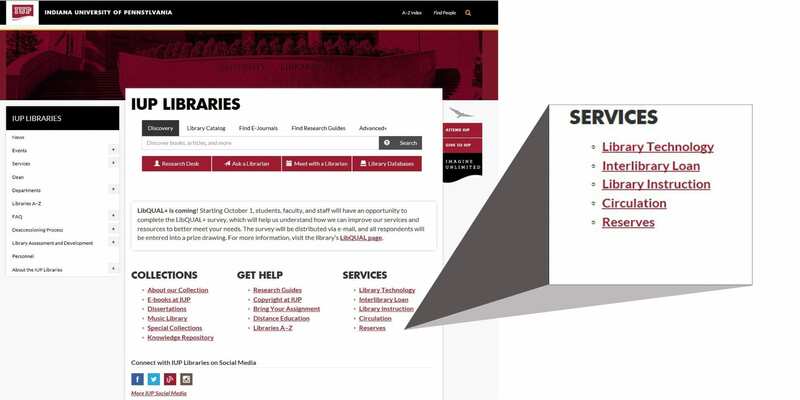 In addition to having the online catalogs, databases, and inter-library loan system, the IUP Libraries website also hosts a section of services that professors can take advantage of when teaching classes that involve any sort of research component. 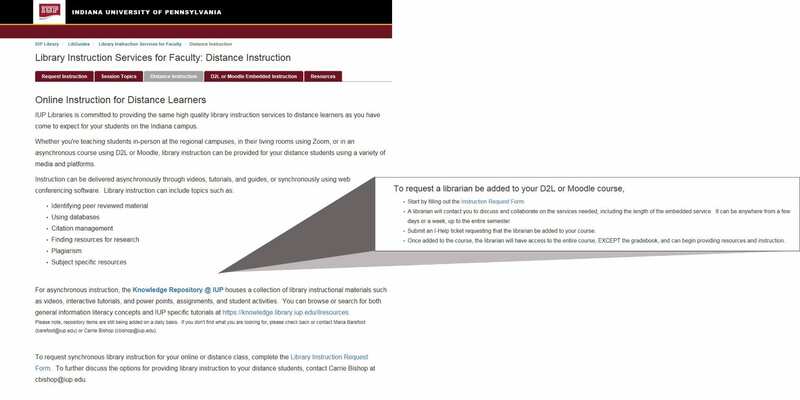 Under the Services tab on the main webpage, there is an option for Library Instruction. Here is where you can find a whole host of faculty resources that include informational sessions taught by a Librarian that you can request for your classes during their research process. These forms and request options are listed under the Faculty Resources tab on this page. Sessions that can be requested include: Basic and Advanced Search Concepts, Information Evaluation, and Research Question Development. Each session is specifically targeted toward a part of the research process and is taught by qualified Librarians who can help students correctly identify how to do research at a University that has access to so many research resources. You can enter an Instruction Request Form online under the Library Instruction page and select a desired session. You can also work with the Library staff to cater your session specifically to your class. This instruction doesn’t have to be limited to an in-person session. 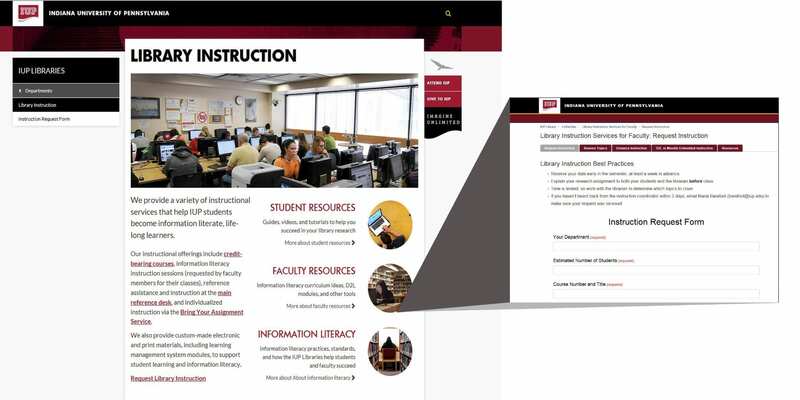 In addition to being available on IUP’s main campus, these services can be provided through the Knowledge Repository at IUP which has tons of content based around instructional materials in the form of videos, tutorials, Powerpoints, and student activities. You can also request an embedded Librarian in your D2L online class. By adding a Librarian to your online class, students will have the opportunity to ask research related questions to someone who can provide them with resources immediately. These embedded instructors can create discussion posts where students can ask for help, provide links or instructional resources, and even provide live research consultations. In addition to all these online resources, IUP Libraries provides full time service through the reference desk which now includes an online chat option for anyone who visits the IUP Libraries website. The IUP Library has a wealth of information available to students and instructors to help guide them through the research process, and if you ever have questions about these services, there is always someone on call for all your research needs. If you have any questions about any of these Library resources, contact Maria Barefoot at barefoot@iup.edu.